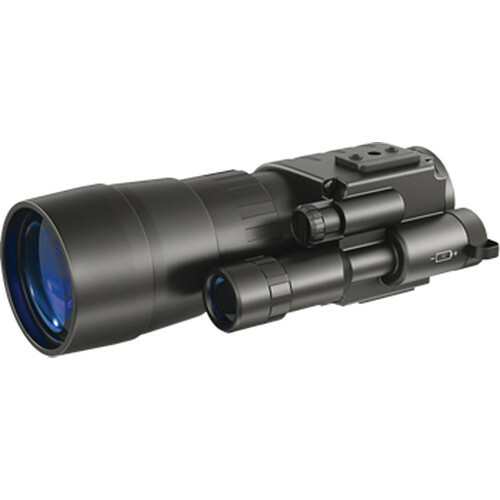 Engineered with the latest optics in night vision technology, the Pulsar Challenger GS CF-Super Gen 1+ 3.5x50 Night Vision Monocular features a powerful, integrated IR illuminator and 3.5 magnification for observation during insufficient levels of natural illumination at long distances. Its CF-Super image intensifier tube provides the highest edge-to-edge resolution for any Generation 1 device. 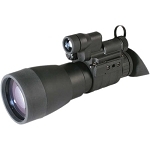 Equipped with two diametrically-positioned tripod sockets, this night vision monocular can be head mounted (left or right eye) or mounted on a 1/4-inch tripod socket. 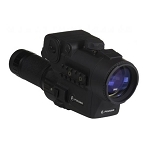 The Pulsar Challenger GS CF-Super Gen 1+ 3.5x50 Night Vision Monocular operates by a single-switch control, offering ease of use and preventing accidental activation of the IR illuminator. 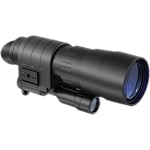 Outfitted with a five-lens eyepiece, the Pulsar Challenger GS CF-Super Gen 1+ 3.5x50 Night Vision Monocular minimizes distortion on the edges of the field of view and increases sharpness and contrast of the image. Its durable, fiberglass reinforced plastic housing enables reliable use in inclement weather conditions such as thick fog, heavy shower, dust, sand storm, etc.